Clapton had left the Robert Stigwood Organization by this point in time and signed with Warner Bothers. This 1982 greatest hits package is typical RSO product. Nice packaging and safe content. The only real surprise is the welcome inclusion of "Let It Grow" from 461 OCEAN BOULEVARD. Replacing "Willie and the Hand Jive" and "Swing Low Sweet Chariot" with EC originals such as "Let It Rain" from his debut solo album and "Hello Old Friend" from NO REASON TO CRY would have improved this collection. A solid album but not essential as there are better compilations out there. I don't have this but I have all of the songs on here. The first problem is it's just a shamelessly short CD (probably just a re release of an LP on vinyl?) and the second BIG mistake is that the man who did the track selection didn't put a single blues track on here. As far the tracks that are present here. I don't understand why there is Willie and the Hand Jive or Swing Low Sweet Chariot. Let it rain and Pretty blue eyes would have been better together with Bell bottom blues and Hello old friend. Still, Cream of Clapton is the best single disc compilation since it has all these songs and even some of those I mentioned plus a brief retrospect of Cream. As far as greatest hits packages go, this is a pretty good sampling of Clapton's 70's output. Everyone has their own choices for such compilations but I feel it would have been a stronger collection with the substitution of "Let it Rain" and "Hello Old Friend" for "Willie and the Hand Jive" and "Swing Low Sweet Chariot". 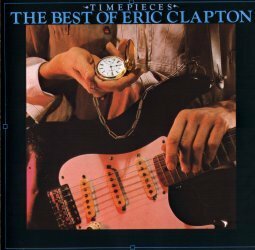 This is a good disc to fall in love with Clapton. It contains a lot of the songs that are "Clapton known". I' m kind of a fan of live albums, but this is a very easy album to love.